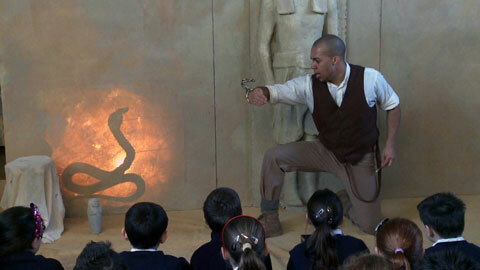 More than 6000 children across Merseyside went on an Egyptian adventure – without even leaving their schools! They all took part in Ancient Egyptian Adventure – The Secret of the Jewelled Heart, an ambitious collaboration between National Museums Liverpool and theatre Hope Street Ltd that draws to a close this month. Actors performed the atmospheric show to children inside a ‘pyramid tomb’ stage set, as part of a day of ancient Egyptian activity. The theatre and museum worked together to find new and innovative ways of exciting young people about ancient history and museum collections. The unique ‘spectacle’ has been taken into 60 selected schools in Liverpool, St Helens and Knowsley. The experiment is part of the government’s Find Your Talent pathfinder which aims to get young people into creative and cultural activities. The response from schools has been exceptional with teachers saying the unique approach had ‘a positive and educational impact’, was ‘visually stunning’, ‘outstanding’, and of being ‘completely gobsmacked’. • High-impact performances that put children in the thick of the action as they follow the show’s intrepid explorers into the very heart of the ‘pyramid tomb’. • Hands-on workshops featuring replica artefacts from World Museum’s collections, helping children get close to ancient civilizations from the classroom. • An informal celebratory and sharing event for parents and guardians. • A follow-up visit to the museum’s impressive Ancient Egypt gallery to carry on the adventure.